The example in the National Diet Library is the same on the left and right, but there is a different panel in the center. The left panel of this triptych in the Lyon Collection is trimmed on the left side. The left panel in the NDL is fuller and has the signature of Toyokuni I. There is a full copy, the same as the one in the Lyon Collection, in the Musée Guimet. That one shows the Toyokuni signature. Great Success. 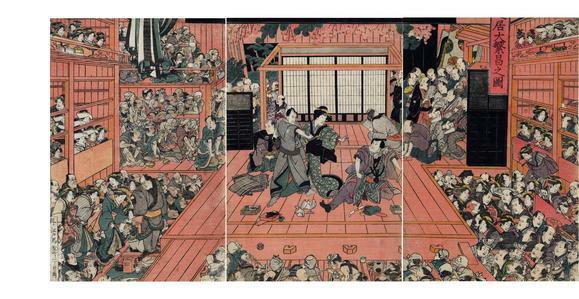 View of interior of Kabuki theater, in the middle Matsumoto Koshirō V.
The publisher is Nishimuraya Yohachi although no seal appears on this triptych. On the left side it shows the address of the publisher: 'Edo Bakuro-cho 2-chrome Kado'. See the Edo-Tokyo Museum link with a different center panel -- it appears that the publisher reused the left and right panels with different center panels for different performances and actors. This triptych is illustrated in a two-page spread in color in Impressions of Ukiyo-e by Dora Amsden and Woldemar von Seidlitz, 2007, pp. 14-15.